From the moment I first heard about TED (over a decade ago) I have wanted to give a TED Talk. On May 3rd, 2015, at TEDxDocklands in Melbourne, Australia, I was given a chance to speak. I took the opportunity to express my first "idea worth spreading", which I truly believe is urgently needed: The future will require an expanded imagination. If you like this talk, please like it on YouTube and share it as widely as possible. WHEN YOU'RE FINISHED: Please scroll down this page. I'd like to share the details of a very special offer. For the past 16 years, my goal has been to empower writers — and screenwriters in particular. And we've got a ton of FREE material to help you take the next step. Thank-you for watching my TED Talk! This is a very big deal for me. I've spent the past 15 years quietly reverse-engineering the complete screenwriting process — which turned out to be the complete creative process. But until now... I've never shared my "WHY". My goal is to build an independent film studio... to make film and television that inspires and prepares us for the future I believe is coming (as described in the talk, above). When I couldn't find the quality and kinds of screenplays I was looking for, I had no choice but to do something about it. 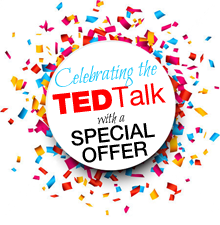 To celebrate the TED Talk, I invite you to join me on a year-long adventure into your own unique imagination. For a limited time, get FAST Screenplay at 60% off! Regular price is $1997* for Unlimited lifetime access + free upgrades. Want to learn more, first — for FREE? While FAST Screenplay works for ANY writer of movies, television, novels, or any other form of storytelling, I only want you to take the plunge if YOU believe it's right for YOU.  Watch some of my YouTube Channel videos to get a feel for what I'm all about.  Read the complete How the System Works page and discover the 7 phases.  Sign up for the 10-Day Free Start and begin the system at no cost at all! Remember: Our goal is to help you write screenplays that get turned into films, so we'll always give you vastly more value than you expect or pay for. Even our free content is jam-packed with extraordinary practical value for writers of all levels. Go one step further. If you want to learn more (but aren't ready to commit to going all the way), you might like my starter book Writing FAST: How to Write Anything with Lightning Speed. It is a (very simplified) overview of the FAST System, and it's applicable to any kind of writing. It's available in paperback or on Kindle at Amazon.com. And of course, if you have any questions at all, don't hesitate to Contact Us and let us know. Things have gotten very busy thanks to this TED talk, but we're here to help... every step of the way. Thanks again for watching my TED Talk! And please don't forget to share it with as many people as you can! To expand our imagination exponentially, we need to empower a global chorus! I wish you extraordinary success, and I look forward to seeing your unique window on our world. P.S. The offer to join FAST Screenplay for just $897 is only available for a limited time. We try to give personal attention to every participant, so we limit the number of participants at any given time. So this offer will end without notice, as soon as we reach capacity. * Although we are based in Australia, our prices are in USD because the vast majority of our expenses are in USD and every dollar of your enrolment fee goes back into the system, to continuously build and expand it.